Notes - EASTER - A TIME TO REMEMBER AND A TIME TO REJOICE! - Easter is a special time! - A time when we celebrate what Jesus did for us. - We remember how He died for us. - And we remember how He rose again and conquered death. - We remember how He made it possible for our sins to be forgiven. - We remember how the access to the Holy of Holies was open for all. - It is a special time! - Jesus is the Messiah! - Generations had waited for Him. - The Saviour, the Prince of Peace. - Pilate questioned Jesus on this very issue. - Luke 23:3 So Pilate asked Him, "Are You their Messiah - their King?" "Yes," Jesus replied, "it is as you say." - By His own admission, Jesus settled the issue - forever. - Never to be debated again. - Jesus reply was YES. - He is the Messiah! - He is the Saviour! - He is the Prince of Peace, the mighty God, the one we all needed. - Today He can be your Messiah. - This was the cry of the people. - Luke 23:20-21 Pilate argued with them, for he wanted to release Jesus. But they shouted, "Crucify him! Crucify him!" - Today people still shout those words in their hearts. - Crucifixion was their idea. - This was humanities cry. - Still today people reject Him. - Don't reject Jesus today! - Invite Him into your hearts. - Pilate sentenced Jesus to die. - He did what the people wanted. - Luke 23:24 So Pilate sentenced Jesus to die as they demanded. - They released a criminal (Barnabas) and sentenced Jesus to death. - Jesus was the innocent one. - The innocent had to pay the price for the guilty. - Jesus was willing to do this. - For all the generations. - It was for you and me. - Jesus was able to forgive. - In the midst of all the suffering and injustice He could forgive. - He could because He knew no sin. - Luke 23:34 "Father, forgive these people," Jesus said, "for they don't know what they are doing." - Jesus did not retaliate. - He did not fight back. - Jesus entrusted Himself to Him who judges justly. - He left the judging to God. - He did not look for revenge. - He did not demand an apology. - Never, never, has there been such love. - They saw it through! - The crucified Jesus, the Messiah! - Luke 23:32 When they came to the place called the Skull, there they crucified Him. - In a moment prophecy was fulfilled. - Imagine the pain and the suffering. - This is an extended death. - Not a 'kind' quick death. - But an extended suffering. - Luke 23:44-45 By now it was noon, and darkness fell across the whole land for three hours, until three o'clock. The light from the sun was gone - and suddenly the thick veil hanging in the Temple split apart. - This was a significant event. - The curtain had separated the Holy of Holies from the temple. - Only the high priest was able, once a year, to enter the very presence of God. - In this instant, the Holy of Holies was opened to all. - We could have access to the presence of God. - Access to God was made available to us forever. - Luke 23:46 Then Jesus shouted, "Father, I commit My Spirit to You," and with those words He died. - At this time God turned His back on Jesus! - As He placed the sin of the world on His Son. - Jesus died for you and for me. - He is the turning point of our lives. - Luke 24:1-3 But very early on Sunday morning they took the ointments to the tomb - and found that the huge stone covering the entrance had been rolled aside. So they went in - but the Lord Jesus' body was gone. 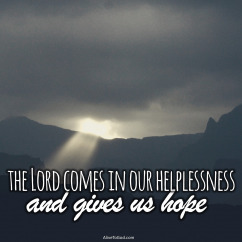 - When Jesus died, even His disciples and friends lost hope. - They went to look for His body in the tomb. - Every effort had been made to secure His body. - The tomb had been sealed. - Guards had been placed on duty to guard the tomb. - But by the time the disciples got there, He was gone. - Luke 24:6 He isn't here! He has come back to life again! - Alive never to die again. - Having made the way clear for us to know Him and to have eternal life. - God's gift to us was Jesus. 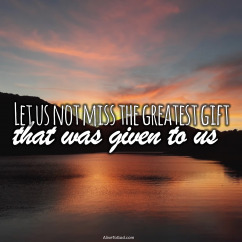 - Today Jesus is still God's gift to each of us. - Have you accepted this gift? - If so then let's rejoice today.